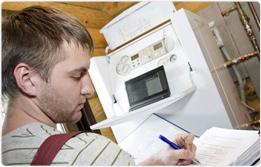 Our boiler installation London teams are fully industry accredited and Gas Safe registered. We operate a series of boiler fitter London outfits to ensure that your area is served quickly and efficiently: and we only install environmentally friendly, energy efficient boilers that save you money off your heating bills. We’ve kept all of our energy efficient boiler installation London teams centralised through our customer services office, which will dispatch the nearest available team to your home or commercial premises for your appointment. Whether you need a boiler installation South London; a boiler installation Central London; or a boiler installation in North London – just call us, and we’ll arrange that the most convenient service team for your area comes out to you. All new boiler installation London visits are charged according to your circumstances. Contact us about your home, new build, refurbishment project or office/commercial premises and we’ll arrange a free, no obligations consultation and quotation. Call us today and see how our energy efficient boiler installation London services can help you.